Obviously, kashrus agencies try to stay on top of what is happening in the field, but, we, the consumers, are not aware of what insects are found in which vegetables, how to identify them and how to prepare vegetables that are insect-free. Of course we can buy pre-washed vegetables with the certification we prefer, but not all vegetables are sold pre-checked and so the burden of proof that the produce is insect-free is on the good old kosher consumer, you and me. We have requested of Pos’tiv Produce to partner with us in establishing a training program in insect inspection for mashgichim and rabbis, as well as for the general public. Read on and learn what the problems are and how we plan to improve the status quo. And, yes, you can join us too. The need to upgrade insect inspection. There are four basic reasons that, despite all the good intent, insect inspection by some of the mashgichim in the field and by some of the consumers who do their own checking at home fall seriously short of what is needed. 1. Does the mashgiach / consumer know what they are checking for? Each vegetable has specific insects which infest that type of produce. You can’t tell if a vegetable is infested unless you know which insects infest this species and what they look like. Each type of fruit and vegetable has its own type and location of infestation, and its own method of inspection. The inspection method used for one does not work for another. You must be trained to identify and locate an insect through a variety of methods, such as a leaf inspection, a cloth inspection, a surface inspection, and an interior inspection. Otherwise, you may not realize that the dot you have just seen, is, in fact, an insect. I recently received a call from a housewife asking about leaf miners, a particular insect found in many leafy vegetables. She said that she looks for it, but doesn’t know what she is looking for and therefore cannot know if she has found it or if the vegetable is really insect-free. I sent her a file with pictures of the leaf miner in different vegetables. A mashgiach told a visiting rabbi that he checked the celery very well. He proceeded to show him how clean they were after washing. The rabbi pointed out quite a few that had leaf miners inside them and the man began to weep. “I am extremely careful. Why didn’t they [his superiors in the kashrus agency] tell me to look for these insects?” Indeed, why didn’t they? It seems that even well-meaning people are not always trained to check properly. While we assume that most kashrus agencies do train their mashgichim in insect infestation, not all mashgichim have the breadth of knowledge to spot the wide variety of insects. Some vegetables have a great number of different kinds of insects. Additionally, anyone checking for insects must know that each kind of insect may come in a variety of different types, colors and sizes. The ability to recognize one type of a specific insect may not mean that you are capable of recognizing another type of that very same insect. The mashgiach should receive training in spotting all relevant insect kinds and types. When a mashgiach is checking for insects, he must know exactly which insect he is looking for and what they look like, if he doesn’t, then he does not know what he is doing! The husband or the housewife who holds a piece of lettuce up to a light for a second and says that they see nothing, cannot say that he/she has fulfilled their duty. First, learn what you are looking for and then search. 2. Does the mashgiach know how to check for this particular vegetable? When working for a caterer, a mashgiach must realize that he may have to check different types of vegetables, even those which he normally doesn’t get to use — many strange-sounding vegetables. He can’t just check any vegetable the same way that he would check another vegetable. He must ask for directives from his supervising rabbi. In lettuce, you would deal with thrips, mites, aphids, spiders, flies and leaf miners, but in figs - you would typically find worms inside. Consumers like to believe that they can check produce themselves. They can, but only if they have been trained to do so. 3. Under what kind of conditions do mashgichim check? You would be shocked to observe a mashgiach working at a restaurant checking produce. He is often relegated to a corner of a table, to the back of the fridge, or some such out of the way place. How long could anyone be expected to inspect produce in such a challenging environment? So, too, the housewife. Does she relegate her produce inspection to an under-the-counter light? Does she have a high-powered loop to corroborate her visual checking? A light box? 4. Does the mashgiach (or a housewife/husband) have the “savlanut” (the forbearance) to laboriously check all the vegetables needed for even one meal? I have seen many a person who is under pressure. Who can stand up to the cook’s beckoning call to the mashgiach, “Hurry up; where’s the greens?” Can the housewife busily preparing for Shabbos in the winter, or feeling rushed by her guests who arrived unthinkably early, take the time to properly examine dozens of leaves of lettuce that are anything but flat? Given that not all is perfect, how can we improve the situation? Obviously, Pos’tiv as well as all kosher-certified produce beckon you to simplify your life with their products. And that is a legitimate way of dealing with the situation. But it will not work for all people all of the time. Take the caterer who must serve hundreds of salad plates. Will he be willing to pay for pre-washed Pos’tiv vegetables? Many do, especially after considering the great responsibility, the labor savings, the expense of a good mashgiach, and of course the convenience of having one less thing to worry about. I know one caterer who has a two-tier policy. He uses Pos’tiv whenever possible. For the rest, such as other vegetables, and on short notice, he hires a special mashgiach, not one who “also” checks vegetables but one who “only” checks vegetables. For that he pays more than double the hourly rate ($35 per hour and up). He wants to sleep at night and he also eats from his catering. In fact, the mashgiach of the yeshiva where he learned prior to going into catering advised him to use the kosher standard of “Would you eat it in your house?” to determine what he should allow in his catering. So, here is the plan. 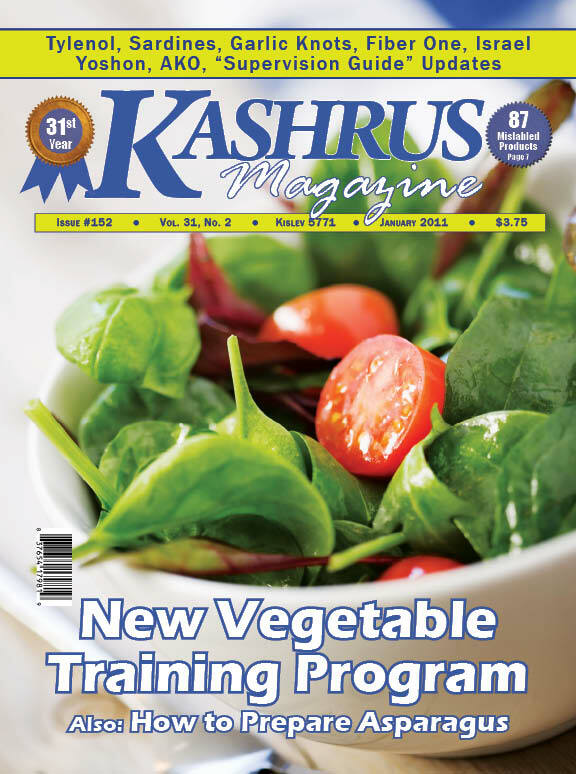 Pos’tiv Produce, a leader in kosher-certified fresh pre-washed produce, has agreed to join KASHRUS in promoting a training program for mashgichim, rabbis and lay people. The initial program includes a full-day tour and training at the Pos’tiv plant in Allentown, PA. Roundtrip transportation will be provided for a minimal fee of $10 and there is no charge for the training program and tour. The initial program will be close to 5 hours and should be valuable enough in its own right. But, Pos’tiv will follow up with a second program in Brooklyn for more advanced training, also free of charge. Those completing both parts will receive a certificate which, for someone in the kashrus field, will prove very worthwhile. I plan to accompany the first trip to Pos’tiv and will offer a program of general kashrus while we are traveling. The trip to Pos’tiv will leave in the morning and return to Brooklyn about 6:00 PM. The day for the first trip will be determined by the interest of the participants. Those who cannot make the first tour will be offered other opportunities for subsequent training sessions. Call KASHRUS at 1-718-336-8544 (or email us at kashrus@aol.com) now to express your interest in participating and to learn about all the days being scheduled. Join Rabbi Yosef Wikler for a day trip to Allentown, PA.
We will talk kashrus, learn to identify insects, observe the methods used at Pos’tiv and the mashgichim who do their checking. A boycott of thousands of people against all Campbell's products for their supporting Hamas has taken place on Facebook. The real fallout from this story, however, was in the availability of kosher meat for those in Ireland and other UK communities. Slaney’s decision was based upon the recently discovered policy of McDonald’s restaurants to refuse to use meat that was religiously slaughtered (either by halal or shechita). This policy came to light when it was discovered that some McDonald’s restaurants had used halal meat. Subscribe now to read more of "World Kosher News." “Who do you have in mind?” I counter nervously. “You know Austin Stegler, the tall kid in your class?” asks Malka Hecht, principal of Chabad of Bergenville Sunday School, where I am privileged to teach. She delivered this whole explanation in one breath, as if afraid that I would cut her off with an abrupt “No”, if she only gave me the chance. I can’t say her fears are too unfounded. I mask my uncertainty and attempt to delay my response with some gentle teasing. She laughs with me, but her tone, when she responds, is serious. There’s no getting around this, as nervous as I am to host an entire family so far removed from even the slightest vestige of Jewish observance, and to undertake the responsibility this entails. I promise her I’ll speak to my husband as soon as he returns from night Seder. As I hang up the phone and resume folding the laundry, my mind wanders to the beginning of my bridge – building career, the bumps and hurdles, as well as the triumphs and accomplishments. I remember my ’91 Ford Contour that made the daily trek across the Verrazano Bridge, carrying a full load of teachers from the sheltered environs of Lakewood to the choppy waters of Neshama High, a kiruv school catering mainly to the secular Sefardic communities in Brooklyn and its environs. I remember feeling, as I crossed that bridge countless times, that it wasn’t so much that I was leaving Lakewood behind, but that I was bringing Lakewood with me, bridging the world of Torah to the world of secularism which characterized the daily lives of my students. I remember our heated debates in the classroom. Throughout all the discussions on the meaning of life, the purpose of man, the beauty of creation, I slowly brought them closer to the mindset with which I am imbued. I remember, as each year progressed and our relationship deepened, our conversations grew more personal. We delved into other religious issues: morality, Shabbos, and sanctity of the home. The topics were wide ranging and endless, often controversial and delicate. And through it all, I managed to hold my own, always seeking advice whenever I felt I was going over my head. The bridges became fortified as the years advanced and I began making the trek in the opposite direction, bringing my students across the Verrazano, to my home. I remember those first few Shabbosim, the apprehension preceding them, the doubts… My home is far from the picture-perfect setting in the books, with snowy tablecloths, candlelight casting its aura, pristine children freshly bathed with golden curls tied back with frilly bows. Will they view my home as dirty and messy? Will they think all religious children are unruly? Will they perceive Lakewood as extreme and narrow-minded, giving them more fodder for their ongoing vendetta against religion? Despite my doubts, invite them I did. And, to my surprise, they came. There was no storybook Shabbos, but there were special moments and experiences, many of them. I remember Devora and Daniella, who stared transfixed as my husband blessed the children, the expressions on their faces bespoke of a longing for a father who had such a special bond with his children, unlike their own who was an abusive alcoholic. I remember their timid voices asking my husband if he could bless them too. I remember Jenny, who asked me if she could light candles with me, and sat and watched her candles burn without moving a muscle, until the men came home from shul. Her eyes, always glazed over due to some illegal substance or another, now glowed with an internal spiritual light. It’s been a while since I’ve had a Shabbos guest of that nature. Ever since I’ve left Neshama High to work for Chabad, I haven’t been granted the opportunity. As the doorknob turns and I rise from underneath my now empty laundry basket to greet my husband, I know what my answer will be. The time had come to build another bridge. The Shabbos went well. We didn’t stay up all night pondering the mysteries of life. There were no dramatic declarations of the undeniable truth of Judaism or the beauty of this way of life. But, as the flickering flame of the havdallah candle cast its shadows on the somber faces in the darkened room, I knew that I had done my job. A friendship had been formed, and another bridge had been built.